In fifth grade math, your child will be solving division problems that contain mixed numbers. Use the interactive games below to help your child succeed with this math skill. 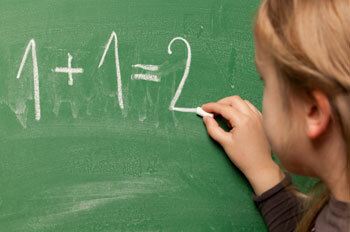 When dividing mixed numbers, your child should begin by changing each of the mixed numbers to fractions. To change a mixed number to a fraction, your child should multiply the denominator by the whole number, and then add the numerator. The original denominator will stay the same in the new fraction, which is usually an improper fraction. For example, 5 2/7 can be rewritten as 37/7 because 5 x 7 = 35 + 2 = 37. After you've converted all the mixed numbers in the division problem, the next step is to invert, or flip, the second fraction. The operation sign should also be changed from division (÷) to multiplication (x). For example, in the division problem 2 1/2 ÷ 4 1/3, first change 2 1/2 to 5/2 and 4 1/3 to 13/3. Invert the second fraction, so 13/3 becomes 3/13. The division problem would then become a multiplication problem that would look like this: 5/2 x 3/13 = 15/26. For this activity, you will need several empty egg cartons, which will be used to model mixed numbers. Jellybeans, or another similar candy, will be used to fill sections of an egg carton to show fractional amounts. To model the whole number portion of the mixed number, fill the egg carton completely. Egg cartons that are only partially filled will represent the fractional amount of the mixed number. Using the cartons and the jellybeans, model two mixed numbers and have your child divide them. It may be helpful for your child to solve the problem on paper and then to check his or her work using the hands-on materials. For this activity, you will need a checkerboard. Before beginning this game, label each checker with a mixed number. If you do not want to write the fraction on your checkers, feel free to use a piece of tape for labeling. You and your child will play the game of checkers as it is usually played. However, when a player uses a checker to jump another checker, he or she must divide the two mixed numbers found on the checkers. When a player moves a checker, he or she will divide the mixed number on the checker being moved by the mixed number on the closest checker.